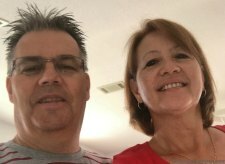 My sister, Sandie, had a couple of extra days off from her job at a preschool and wanted to know if me and Soko would like to meet her and her husband, we call him Mini, in Tennessee. She thought it would be fun to hike the beautiful Great Smoky Mountains. (Read all about here it in an upcoming post.) So Sandie and Mini drove 11 hours from NY and we drove 7 hours from NC and met in Gatlinburg, TN. 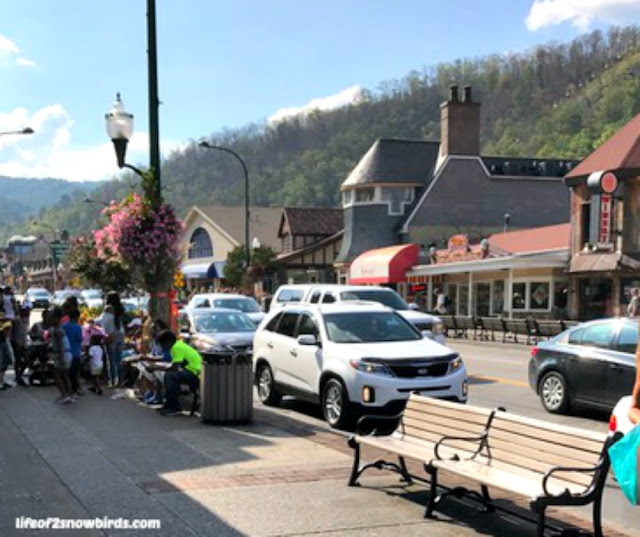 By the time we all arrived in Tennessee and checked into the Holiday Inn Express Gatlinburg Downtown, it was too late to go hiking. We decided that going out to get a late lunch then checking out the downtown area would be the itinerary for Day 1. 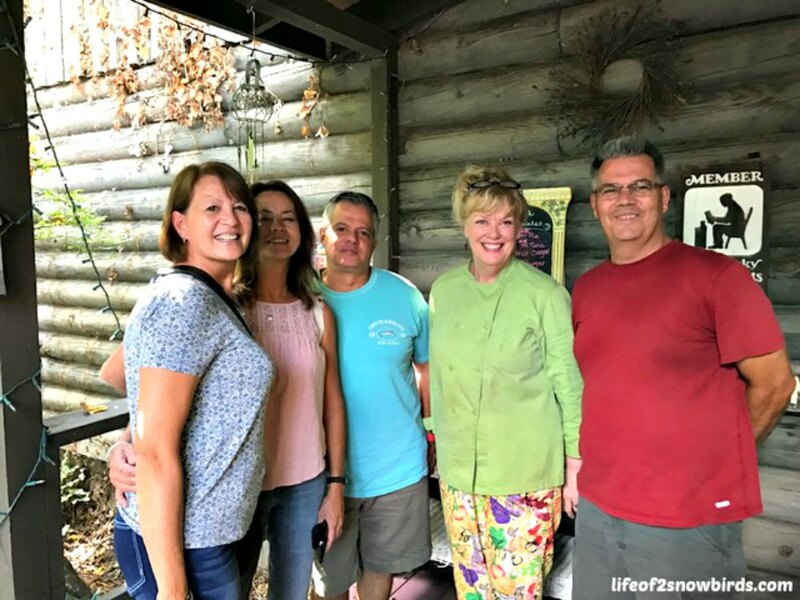 When we were together in Florida in August we sat down to make some plans for our Tennessee vacation. 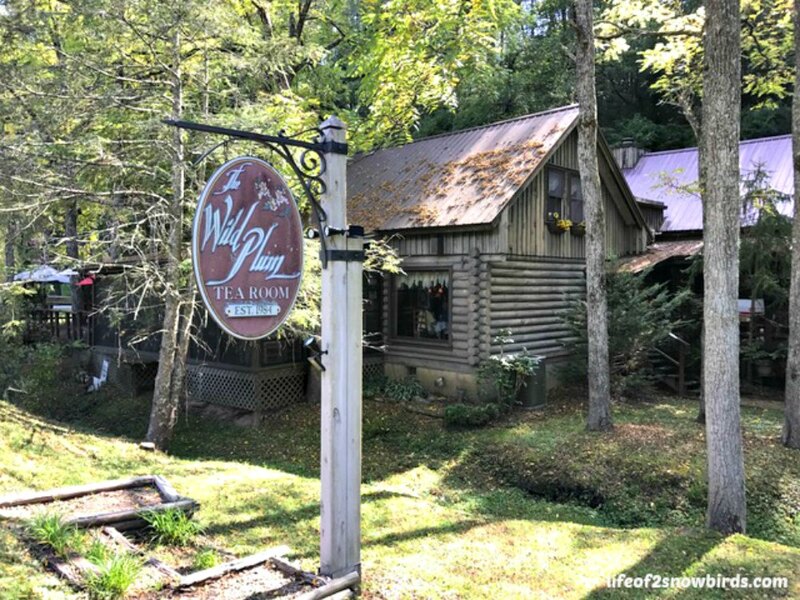 While we were searching for the best places to eat in Gatlinburg, we came across reviews of a quaint little restaurant in the middle of nowhere and knew we had to eat there. 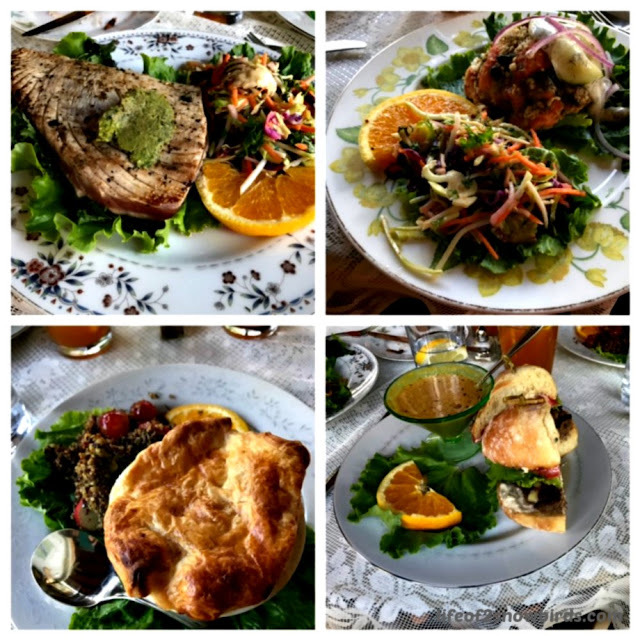 So off to The Wild Plum Tea Room we went. We learned that the restaurant was inspired by the tea houses of Austria where the atmosphere is welcoming and relaxing and where you could gather to enjoy each others stories and eat fresh food. The Wild Plum Tea House uses whatever is growing in their garden and seasonal and fresh foods. The menu changes daily depending on what foods are available. We had a couple of choices of where we wanted to sit. We chose the porch but could have chosen the outdoor deck or inside dining room. If you had your dog with you it would not be a problem as you could sit on the deck with your pet by your side. On our way out, we were lucky enough to run into the Chef/Owner, Kacey Rothwell. She asked how we enjoyed our meal and thanked us for coming. We told her how we loved our meals and that we will definitely come back if we are ever in the area again! We only had 2 1/2 days to explore Gatlingburg and really wanted to spend most of our time hiking the Great Smoky Mountains. So after lunch, we decided to just drive through Pidgeon Forge, Gatlingburg's neighboring town to get a glimpse of Dollywood. It is all about Dolly Parton for sure in this area. She is probably the most famous person ever born here. We drove by her two dinner theaters. Dolly Parton's Dixie Stampede is all about singing and dancing and a salute to the USA and features 32 horses that skilled riders do all kinds of tricks with. 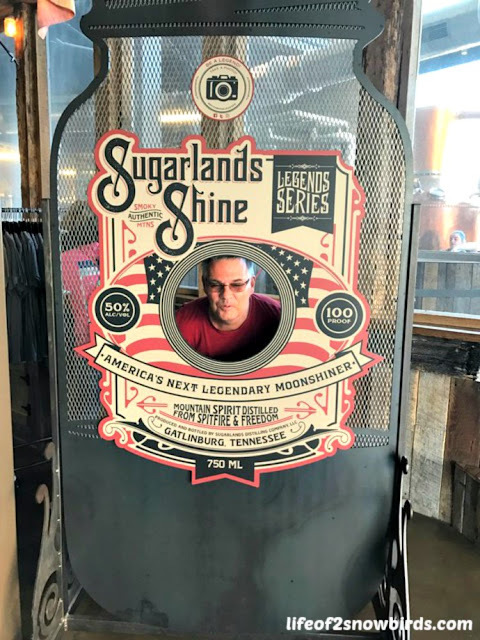 Dolly Parton's Great Smoky Adventures is a show that has more of a story line and gives you an idea of the what it was like in this area and how people lived here in the 1930's. 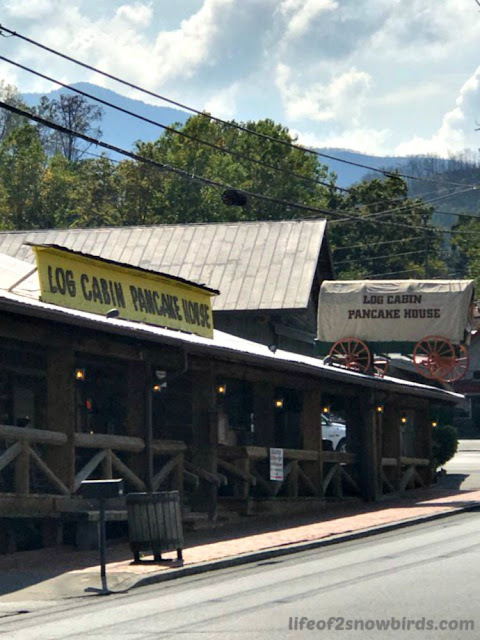 Besides for the Dolly Parton offerings, there were a ton of other attractions on Pidgeon Forge's main strip including Elvis & Hollywood Legends Museum and the Titanic Museum. After our tour of Pidgeon Forge, we dropped off our car at the hotel. We were very happy with the location of the hotel which was only a block away from the Downtown Gatlinburg main strip and right next door to Saint Mary Catholic Church. Their 7:00 pm Saturday mass worked perfectly for us that weekend. It was also right across the street from the Log Cabin Pancake House, The restaurant is on all the "top 10 places to eat in Gatlinburg" lists and they have great reviews on Yelp. They had people waiting outside to get in every time we passed. We never ate there as our Holiday Inn had a really good breakfast and it was included with our reservation. 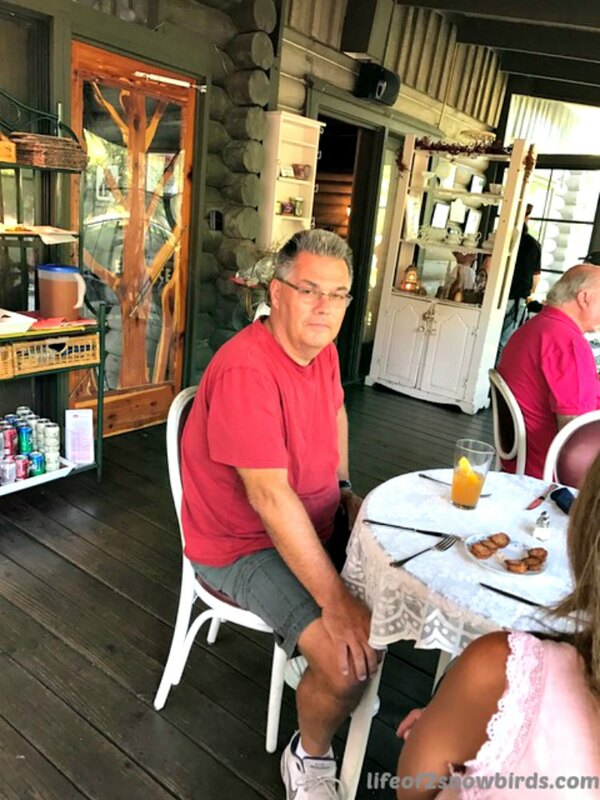 (If you are trying to be a bit frugal on your vacation and trying to get the best deals, it's always good to check to see if the hotels you are considering have breakfast included. If you choose a more expensive hotel that includes breakfast it might be a better deal than the cheaper hotel with no breakfast, especially if you have your kids or grandkids with you. You can also grab some fruit for snacks to take with you when you go venturing out later on.) We were also right up the block from the Gatlinburg Space Needle. 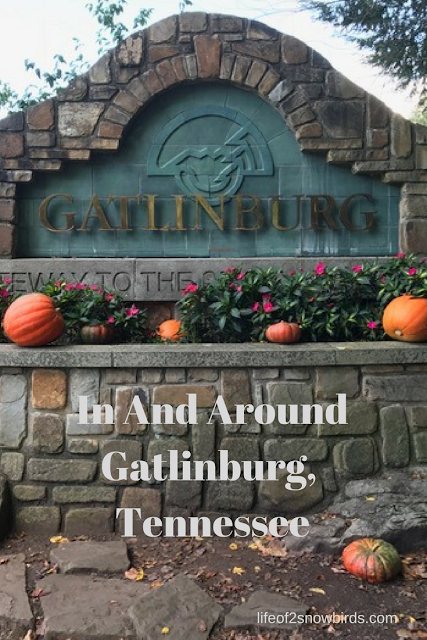 If you go over 400' to the top of the tower you will be able to enjoy the sights of the city of Gatlinburg and see the Smoky Mountains. We didn't go in the tower but I did want to see it and take a picture of it so I was excited that it was just down the block. There are so many things to do in this town. Me and Soko did an over-nighter in Gatlinburg with our kids years ago and did Gatlinburg's Mysterious Mansion which is a self-guided tour of a haunted mansion, The kids enjoyed it a lot because they didn't take it too seriously. I was a little scared but that's just me. We also did the Skylift Gatlinburg which was really fun. You could get off at the top of the mountain to enjoy the sights then hop back on the sky lift for your ride back down. I can recommend both of these attractions if you are looking for things to do here! 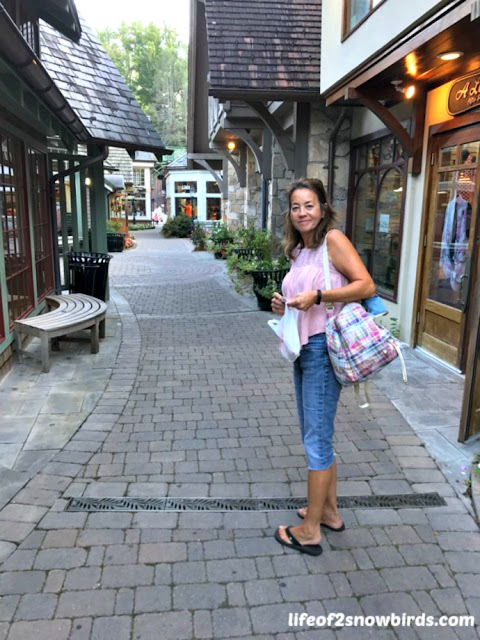 So what did the four of us do in downtown Gatlinburg? Shopping and walking and enjoying each other's company pretty much. We don't get to see enough of Sandie and Mini anymore since we moved to NC 2 years ago so we worried less about sightseeing and more about just spending time together. We did have a fantastic time in the touristy downtown area. I actually do love walking around with all the other tourists and shopping for souvenirs when we are on vacation. I was thrilled to see one of those shops that will carve your names or whatever you want into wood pieces of all different shapes and sizes. You only see these guys in places like this. I needed something for our place in Florida and got one at a very reasonable price and I love how it came out! 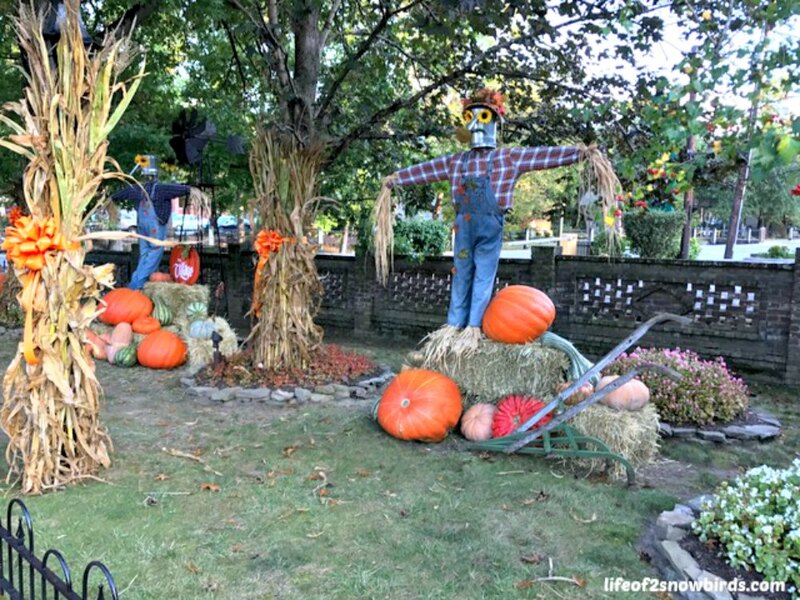 The downtown area was celebrating fall and everywhere you looked you would find beautiful fall displays and landscaping. It added to the enjoyment of walking around the town. Me and Sandie ventured into alleyways off the main road that led to loads of small, mostly crafty, stores that had the most unique things to buy. We looked in the sock store where you could buy socks covered with soccer balls for your favorite soccer player. You could buy socks for your cat lover, dog lover, fisherman and everyone else on your list. We looked in a linen store that had the most gorgeous embroidered tablecloths but at $100 each they were a little to expensive for my budget. Soko and Mini ventured into a shop that sold moonshine and both walked out with 3 mason jars full. Mini paid to sample 15 different flavors of moonshine. He was a very happy camper after that! We found lots of things to buy and enjoyed walking through town We stopped by Ripley's Believe It Or Not. 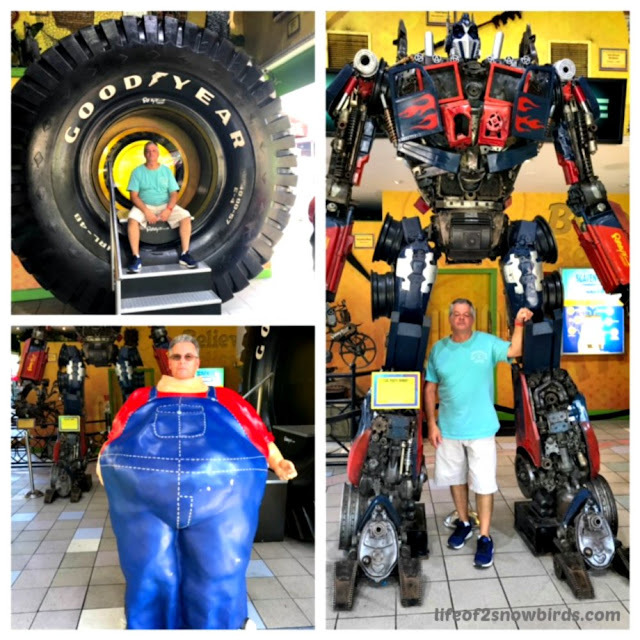 The huge robot made out of car parts was pretty amazing and I am sure there were lots of cool things to see inside but it was time to go back to the hotel to relax by their indoor pool. 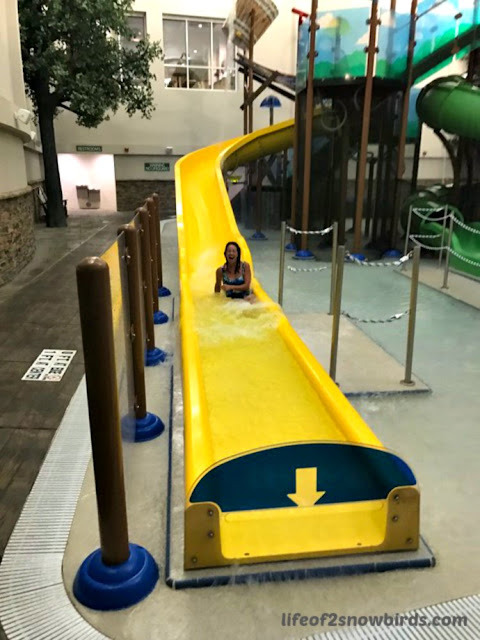 We ended up relaxing by the pool for only a few minutes because when the last of the kids left the water slide area we had to get in there to try out the slides. 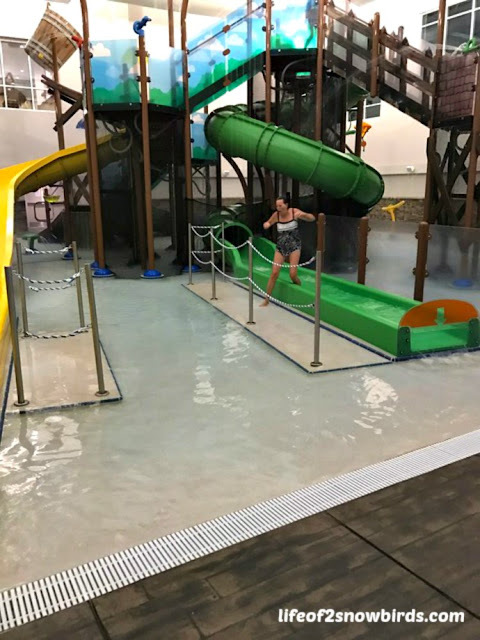 Those slides were so much fun and another perk included in the price of the room! Needless to say, we were all snoring by the time our heads hit our pillows that night. Stay tuned for our adventure in the Great Smoky Mountains and what I learned about hiking that I will use on our next hiking trip. I love Gatlinburg! We took our 4 teenagers there years ago and rented a cabin. Looks like you had as much fun as we did! Sounds like you had a great time too! Thanks for sharing. We had a great time! Hope you have a chance to go back one day soon! What a fun trip! I haven't been to gatlinburg since I was a kid and I have been wanting to go back. We had a great time. I hope you get a chance to go back! Great post and photos about an interesting place!